WiperSoft – Is it safe to use? WiperSoft is a reliable anti-malware utility that can clean your computer from unwanted threats like adware, browser hijackers, unsafe toolbars, and more. It was developed in 2015 and belongs to WiperSoft LLC Team. The utility can protect your system from various online parasites and help you make sure that it stays infection-free as long as you keep it installed and up-to-date. It works on all Windows versions and supports all major browsers including Mozilla Firefox, Google Chrome, Internet Explorer, Opera, and others. Do you need WiperSoft scanner? 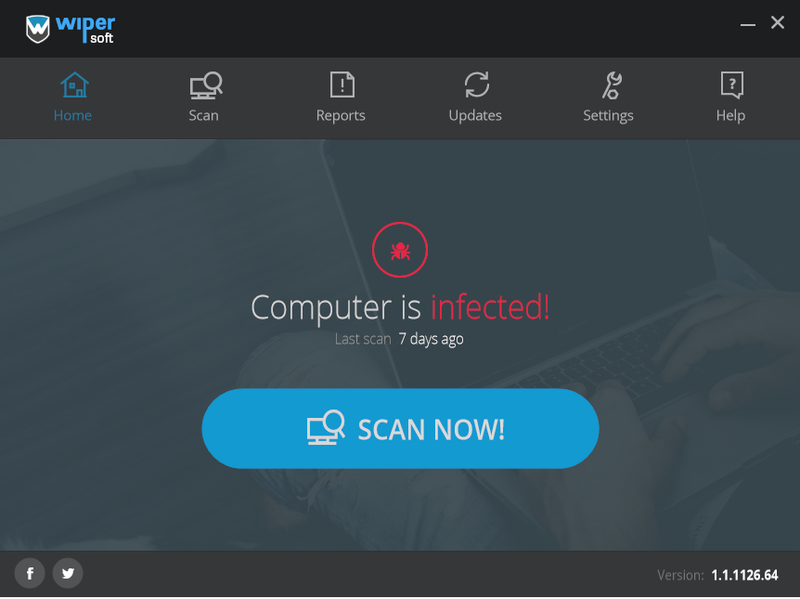 You may be wondering whether it is possible to know whether your PC is infected or not without scanning it with an anti-malware utility. Although there is no way to be absolutely certain, there are several symptoms that you are likely to notice after an unwanted program infiltrates your system. Some of these symptoms include slower computer performance, advertisements constantly appearing on your screen, redirects to suspicious websites, and more. If you have been experiencing any of these symptoms, you should scan your system with the free WiperSoft scanner. WiperSoft is user-friendly, so implementing it should not at all be difficult for you, even if you are a novice. After the download is complete, you can install the utility by clicking the Run button. Once installed, the application will present you with a Home screen. It will contain such buttons as Home, Reports, Update, Settings, Help, and Scan. If you click on the Scan button, you will initiate the WiperSoft scanner. WiperSoft scanner is one of the most important features of the utility as it can help you improve your computer’s performance by locating the unreliable programs that are on it. The scanner has a high detection ratio. It can identify browser hijackers, toolbars, add-ons, adware, unwanted apps, and other undesirable components. Moreover, WiperSoft regularly updates its database, so it can detect even the newest Internet-based threats, which may stay unnoticed by other security tools. Once the utility finds all unnecessary and unsafe elements, it moves on to their removal. WiperSoft cleans your PC automatically, so that you do not have to worry about it being affected in negative ways any longer. After the removal is complete, you will be able to enjoy using your computer to its full potential once again. If for some reason the utility cannot eliminate the detected threat, you can contact the help desk services. You will be provided with technical support free-of-charge. In case the spyware remover finds an infection unique to your computer, you will receive a custom fix. As you can see, there are plenty of reasons for you to make use of WiperSoft. Although it is a relatively new tool, it is in no way inferior to its competition. 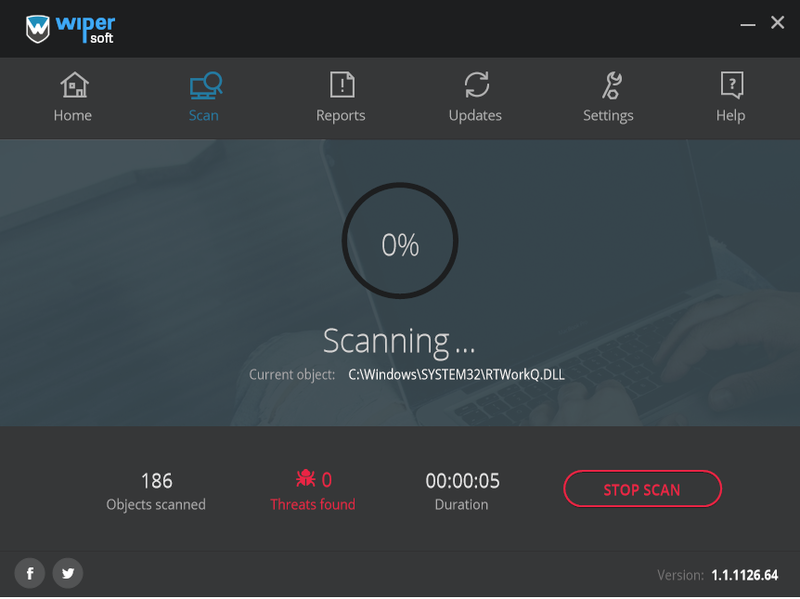 The security program can keep your computer clean and protected from different online parasites with the help of its effective scanning, removal, and technical support features. WiperSoft is available in two versions: the free version and the paid version. The free version guarantees your privacy and presents you with the spyware detection and free scan. The paid version of WiperSoft comes with the already-mentioned functionality as well as threat removal, custom fix, and help desk.